"The way space travel works today, it's almost impossible to take along all the resources you need. 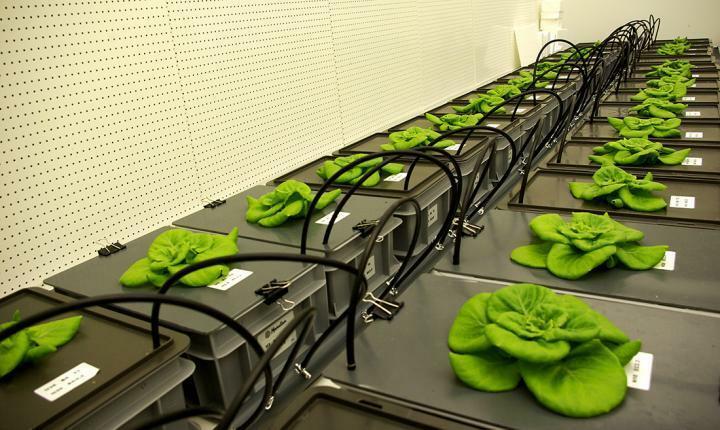 That's why we have to develop a biological system so astronauts can produce their own food, and recycle all of the resources," says Wolff. Today's astronauts eat only freeze-dried and vacuum-packed foods. "Astronauts struggle with having little appetite. They often lose weight. Addressing the psychological aspect of eating something fresh is one of our goals. Vacuum-packed food doesn't really remind you of food. Having something fresh that triggers the appetite and the right receptors in the brain is important," Wolff says. CIRiS tests the new equipment made by NTNU's technical workshop - very sophisticated planters that regulate all the water, nutrients, gas and air the plants need. In space, all the water and food has to be recovered. This means that plant fertilization needs to be as precise as possible. Of all the nutrients plants use, they use nitrogen the most. During her experiments, Wolff looked at different nutrient doses and how they affected the plants' water uptake. "Stationary air affects a layer on the underside of the leaf where the stoma pores are located. When gravity disappears, the boundary layer in the slit-shaped apertures thickens. This reduces evaporation and causes the leaf temperature to increase. Water vapour diffusion to the environment is an important part of plant regulation and can be compared with sweating to cool the body in humans and animals," says Wolff. "The plants become less sensitive to nutritional deficiency because the roots are in direct contact with the nutrients. They're always able to access new nutrients through the water, and can use absolutely all the nutrients available - unlike with soil that binds the nutrients and affects their availability to the roots. And the roots don't rot when the water is mixed with a little oxygen," she says.